Maria Harrington, an assistant professor of digital media, along with Zack Bledsoe ’18, Chris Jones ’18, and Alexandra Guffey, created The AR Perpetual Garden App in collaboration with John Wenzel, director of Carnegie Museum of Natural History’s Powdermill Nature Reserve and Markus Tatzgern, a professor with the Multi Media Technology program of the Salzburg University of Applied Sciences. “This was an opportunity to use new technology to visualize nature, and to do so in a way that represents the most accurate information about the plants,” says Harrington, who worked with a museum botanist to ensure the flora featured are scientifically correct as well as aesthetically pleasing. The app, demonstrated here, includes two scientific visualizations of how deer overpopulation has impacted the Appalachian region. It allows a visitor to view what the region looks like out of balance after deer began over browsing in the area, drastically reducing plants, shrubs and flowers. It also illustrates how the area would have appeared if the woodlands had remained in balance, and without degradation from deer populations. The scenes also include ambient sounds based on scientific insect and bird data, providing more perspective on the environment. “It’s a tool to help museums unlock the knowledge in their collections and bring informal education into the modern era,” says Harrington. 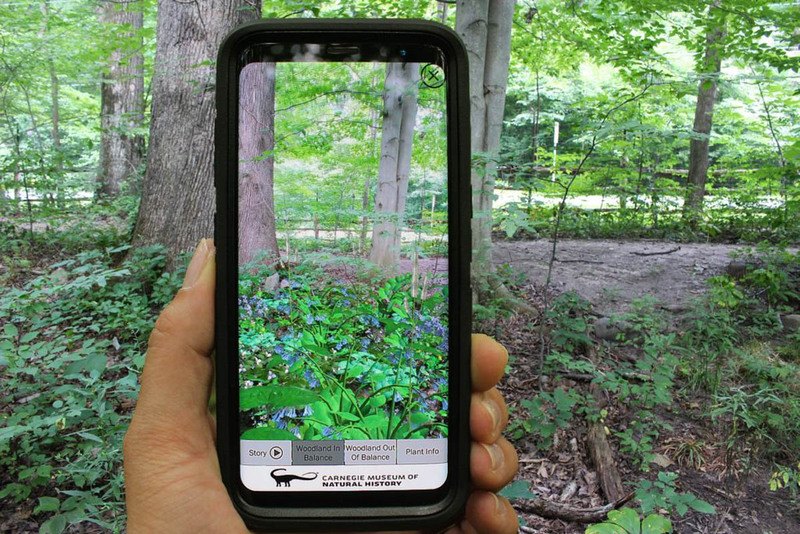 The app can be used by visitors traveling on the actual woodland paths of Powdermill Nature Reserve, among the dioramas of the exhibitions at Carnegie Museum of Natural History, as well as other museums or schools interested in using it as an educational tool for classrooms and field trips. It is available in both Apple and Google Play stores. Harrington plans to conduct research on the emotional, aesthetic and learning responses to the app. She will continue to work with Carnegie to explore new opportunities to incorporate augmented reality into museum exhibits. The app is an offshoot of The Virtual Garden Timeline project, which displays detailed information on the plants in bloom at Powdermill Nature Reserve throughout the year, with many models available in augmented and virtual reality 3D. Powdermill Nature Reserve sits on more than 2,200 acres of woodlands, streams, fields and ponds. In addition to being a popular location for families and outdoor enthusiasts, the Reserve offers educational programs and serves as a research lab for scientists focusing on Appalachian-specific studies in ornithology, ecology, invertebrate zoology, and botany. University of Central Florida: Maria C. R. Harrington, assistant professor; Zack Bledsoe; Chris Jones; and Alexandra Guffey. Carnegie Museum of Natural History: John W. Wenzel, Director of Powdermill Nature Reserve; Martha Oliver; and Bonnie L. Isaac. Salzburg University of Applied Sciences: Markus Tatzgern, professor; Tom Langer; Radomir Dinic; and Martin Tiefengrabner.